everything you would possibly want to learn about Why We Made This blog. (2) You’re our mom who diligently reads pretty much everything her 2 children create. We’re assuming you’re the former, so let us enlighten you. We are Michael & Anika and we’re the writers, interviewers, and editors behind Tales from the Banana Trail. We started this blog after we quit our jobs, sold everything, and decided to travel the world. Now we travel the world full-time on someone else’s dime and you can too…….. S*** no, that’s absolutely not what this blog is about. 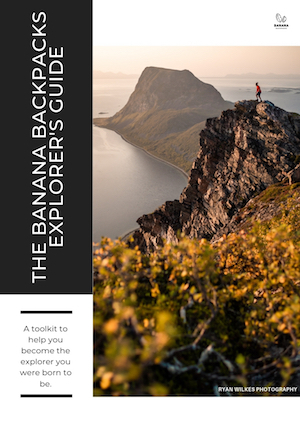 Tales from the Banana Trail started as the blog for our backpack company, Banana Backpacks. When we were launching (see this post for that story) we were told a blog was an essential component of an e-commerce business so we didn’t argue and we began our first trip into the world of blogging. Many, many months later we sat down and thought, what if we could do something different. We didn’t want to create posts about 1000 websites where you can get paid to write, the 10 best socks for travellers, the 10 people you never want to meet at a 7-Eleven in Thailand (actually that could be interesting…). We wanted to get real stories. There are so many modern day explorers who have incredible travel experiences about life-altering journeys and cultural experiences. These are the people you want to run into on a train or at a bar. These are the people whose stories we want to share with all of our friends. These people are the modern day explorers. This blog is a place where you’ll find the incredible stories of these real world explorers and a source of information to help you unleash the full potential of your own inner explorer. We sincerely thank you for stopping by.